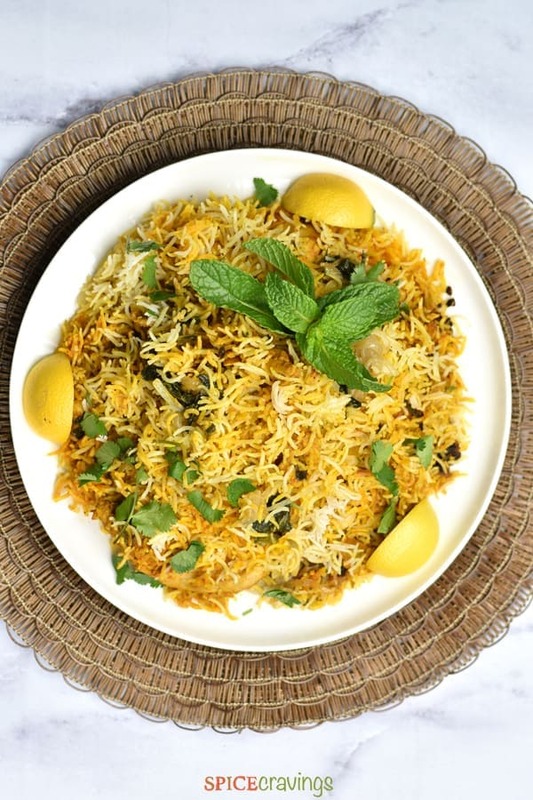 Chicken Biryani or Chicken Dum Biryani is a one-pot Indian classic food dish, where marinated chicken is steam-cooked with aromatic basmati rice and flavored with saffron and cardamom. In this simplified and easy Instant Pot Chicken Biryani recipe, I create authentic biryani flavors using my electrical pressure cooker, the Instant Pot. And it’s all done in under an hour, from start to finish! Traditionally, Chicken Biryani is slow-cooked by steam-cooking basmati rice, with chicken that has been marinated in yogurt and fragrant Indian spices like garam masala. The process of cooking the meat and rice in steam is called Dum, where the cooking vessel is sealed with wet dough and an airtight environment is created for cooking. 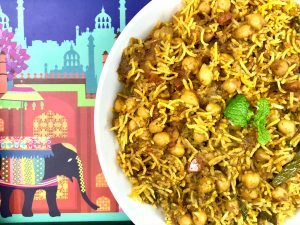 In this easy chicken dum biryani recipe, I mimicked that ‘Dum’ cooking style using my electric instant pot pressure cooker. and has many variations all over India. It is traditionally made with chicken or lamb. The vegetarian biryani is typically made with paneer (Indian cottage cheese) and fresh vegetables. 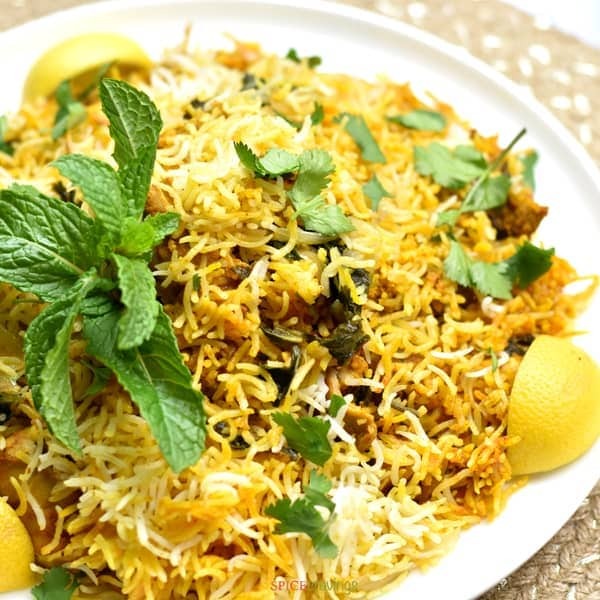 There are many theories about the origin of ‘Biryani’. From what I’ve read about it, I believe that it originated in Persia and was brought to India by the Mughals. As per this this theory, Biryani is an Indian adaptation of the Persian Pilaf. 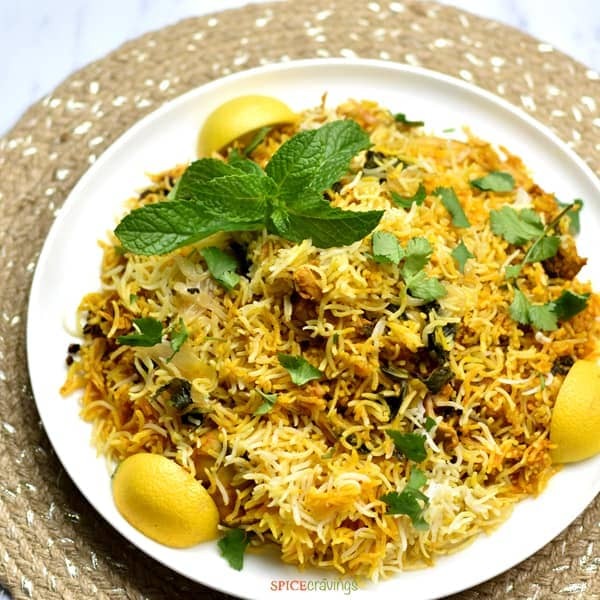 There are two basic ways of cooking a Biryani– Kachhi (meaning ‘raw’) Biryani, in which marinated meat is steam cooked with partially cooked rice. The rice is 50% cooked when I add it to the biryani pot. The rice finishes cooking in the juices released by the meat and marinade. The result is a perfect infusion of flavors. The rice often turns out multi-colored, depending on what it was closest to in the pot– the meat, fried onions or saffron. The other way of making biryani is Pakki (meaning ‘cooked’) Biryani, where I prepare a meat curry first, and then cook the rinsed rice in that curry. instead of paprika if that’s what you have on hand. to the biryani masala marinade. Chaat Masala adds a nice zing to Chicken Biryani, which my family really enjoys. ✓ Wash and soak rice: I start by soaking basmati rice in water. Set is aside for 15 minutes, while I do the following prep-work. ✓ Start the onions: If I am making fried onions from scratch, I add them to the Instant Pot, on Saute mode. They continue to saute and get brown while I prepare the marinade and rice. 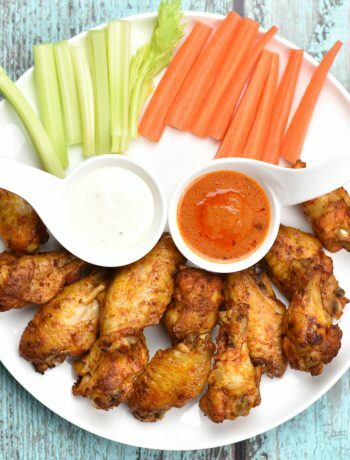 ✓ Marinate chicken: I marinate chicken by mixing all ingredients listed under “marinade for chicken”. Toss chicken in it and keep aside. ✓ Partially boil rice: Rinse the rice 2-3 times, till water runs clear. Then, I partially cook the rice in fresh water in the microwave for about 5 minutes, till it’s 50% done, and then strain it. ✓ Layer Biryani: Now onto layering biryani in the Instant pot. Add 1/2 cup water (for 6 qt). This helps avoid a burn message. Layer the chicken evenly. I layer the rice on top of that in an even layer. Add 1/4 cup water over rice. ✓ Top with fried onions and herbs: Then, I sprinkle fried onions on top followed by chopped cilantro-mint. Add cashews and sprinkle 1 teaspoon garam masala. Pour the saffron-milk evenly followed by melted butter. ✓ Pressure cook: Close the lid. Press Manual (High pressure) for 6 minutes, sealing position. When done, manually release the pressure with quick release (QR), or, let the pressure release naturally for 5 minutes (NPR 5) and then release the remaining pressure manually. ✓ Rest Biryani: Open the lid and using oven mitts, I remove the inner pot from the Instant Pot base, to stop the cooking process. Let it rest for 5 minutes, uncovered. This allows for any excess moisture to evaporate. ✓ Serve: Carefully fluff up the biryani with a fork, without breaking the rice and enjoy with a cucumber-yogurt dip! 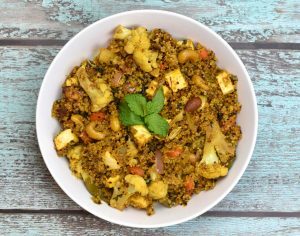 Multiplying this Indian food recipe is easy. To double up this recipe, I create alternate layers of chicken and rice, basically repeating step 3 in the order mentioned. Add 2-3 tablespoons of water in between each layer of rice. Follow all instructions and assemble the biryani in the pressure cooker. Close the cooker and place it on medium-hi heat. As soon as the first whistle goes, reduce heat to medium. Place a flat skillet(frying pan) on the stove and place the pressure cooker on top of that. This will ensure that your chicken doesn’t burn at the bottom of your pressure cooker. Continue cooking on medium-high heat for 6 minutes. 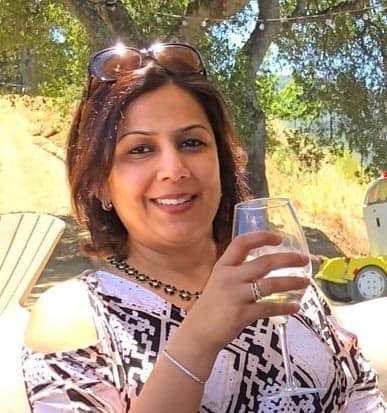 In this recipe, I use a popular Indian spice-blend, called garam masala, for flavoring the chicken, as well as the rice. You can find garam masala at most grocery stores, but I prefer to make my own garam masala blend. It takes under 15 minutes to make enough to last me a month, and the end results are so worth the little effort. 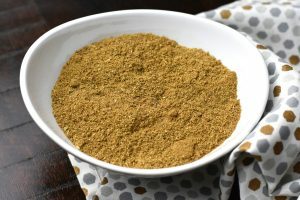 If you have the time to make yours at home too, try this easy recipe for Homemade Garam Masala. I slice 2 medium onions thinly. Then, I heat the Instant pot on SAUTE (high), or, a griddle on medium high heat, and add 2-3 tablespoons ghee or oil and add the onions. I add a pinch of salt to the onions to speed up the process. It is important to keep stirring every 3-4 minutes till the onions are golden brown, which takes around 12-14 minutes, depending on the size of the cooking pot. The wider the surface area, the quicker they brown. Alternatively, I toss thinly sliced onions with melted ghee or oil. Pre-heat the oven to 425°F and cook the onions for about 20 minutes, till they are golden brown. This is a nice hands-off way of making fried onions. I typically make mine using this method, and while the onions are cooking, I do the prep-work for Biryani. I like to serve Chicken biryani warm, with a Cucumber Raita (cucumber-yogurt dip) and a garden salad, drizzled with fresh lime vinaigrette. Instant Pot or Stove top method: Slice 2 medium onions thinly. Heat the Instant pot on SAUTE (high), or a griddle on medium high heat, and add 2-3 tablespoons ghee or oil and add the onions. Add a pinch of salt to speed up the process. It is important to keep stirring every 3-4 minutes till the onions are golden brown, which takes around 12-14 minutes, depending on the size of the cooking pot. The wider the surface area, the quicker they brown. Oven method: Toss thinly sliced onions with melted ghee or oil. Pre-heat the oven to 425F and cook the onions for about 20 minutes, till they are golden brown. This is a nice hands-off way of making fried onions. I typically make mine using this method, and while the onions are cooking, I do the prep-work for Biryani. Prepare marinade by mixing together yogurt, olive oil, lime juice, ginger-garlic paste, salt, spices, 2 tablespoon chopped cilantro & mint. Mix well. Add the chicken thighs and coat well with marinade. Keep aside while you partially boil the rice. Rinse basmati rice 2-3 times, till water runs clear. Soak them for 15 minutes in warm water. Strain rice. You can partially cook the rice in a microwave or stove-top. 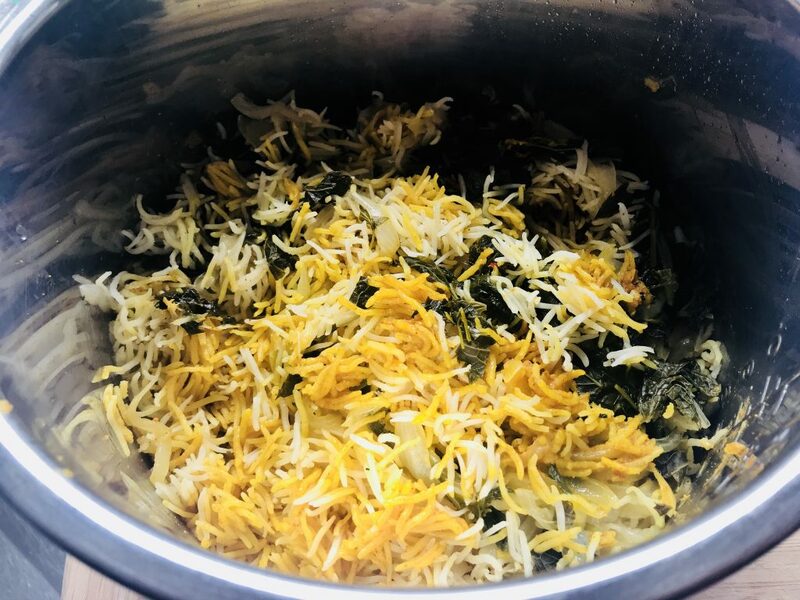 Microwave: Place rice, water, salt, ghee and garam masala in an oven safe bowl, and cook for about 5 minutes on high, or till they look 50% done. Strain the rice and keep aside. If using the stove-top method, boil 4 cups of water in a sauce pan, add rice, salt, garam masala and ghee/oil. Bring back to a boil and cook rice on high-heat for 5 minutes. Turn the heat off and strain the rice. Turn on the Instant Pot. Add 1/2 cup water (for 6 qt). This helps avoid a burn message. Layer chicken evenly. Top with the remaining marinade. Layer the partially boiled rice evenly all over the chicken. Add 1/4 cup water over rice. Sprinkle fried onions on top followed by chopped cilantro-mint. Add cashews and sprinkle 1 teaspoon garam masala. Pour the saffron-milk evenly followed by melted butter. Close the lid. Press Manual (High pressure) for 6 minutes, while the vent is set to sealing position. You can manually release the pressure (QR) right after, or, let the pressure release naturally for 5 minutes (NPR 5) and then release the remaining pressure manually. Open the lid and using oven mitts, remove the inner pot from the Instant Pot base, to stop the cooking process. Let the biryani rest for 5 minutes. This allows for any excess moisture to evaporate. Carefully fluff up the biryani with a fork, without breaking the rice. 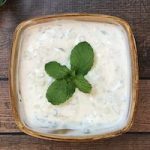 Enjoy with a cucumber-yogurt dip! Time: Prep time includes preparing onions, marinating chicken and partially boiling rice. Estimated Time includes roughly 10 mins for pressure build-up. Cooking time = Time to set for pressure cooking. 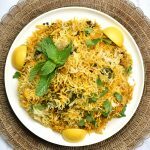 i used to make chicken biryani but couldn’t make it tastier but after trying your recipe i made it better so thanks for sharing such an amzing post. Hi Afroz, thank you so much for sharing that! I am glad you liked this recipe. It’s one of our favorites:) Try the Lamb Biryani, you’ll enjoy that too! My instant pot is 8qt. I was wondering if I need to make any adjustments to the Chicken Biryani recipe. I’m still learning! Hi Shauna, I’ve never made this in an 8qt, but I would suggest increasing the water to 3/4 cup instead of 1/2 cup. I would love to hear how that works in an 8qt. This came out excellent! Even my young kids asked for seconds! That is always wonderful to hear! 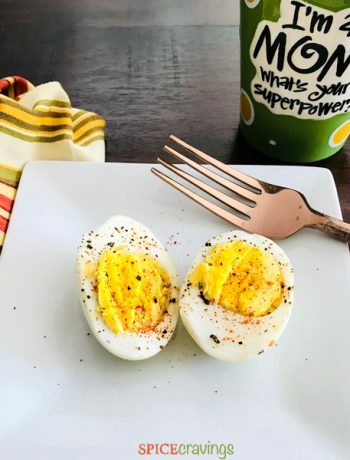 I am so glad your family enjoyed this- it’s one of our favorite family meals 🙂 Thanks so much for sharing your feedback! If you wish, you can rate the recipe by clicking on the stars in the recipe card. Thanks! Quick questions, so you cooked chicken for only 6 mins ? Yes, I use boneless skinless chicken thighs which I cut in half, width-wise. They cook in 6 mins. That sounds yum! Glad you enjoyed the recipe!